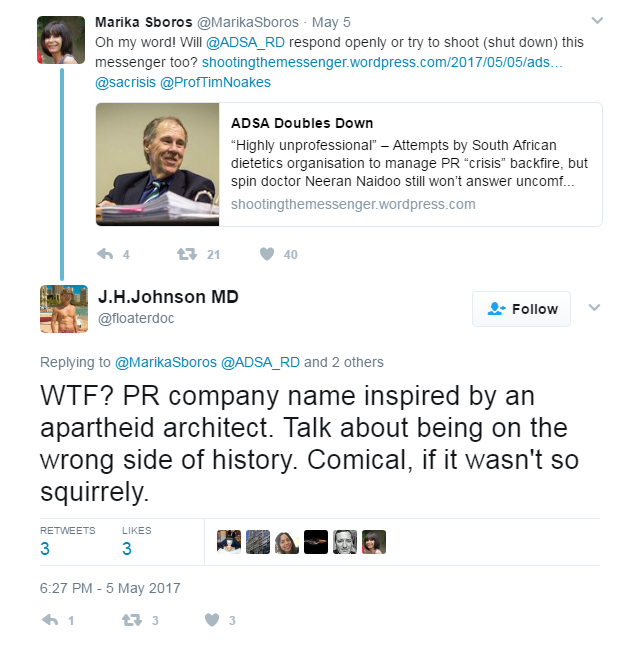 I recently blogged about the Association for Dietetics in South Africa (ADSA), whose former president reported University of Capetown professor Tim Noakes to medical authorities for a single tweet in February 2014 (click here to read more). ADSA hired crisis management company Hewers to field questions about its uncertain role as complainant in the case subsequently brought against Noakes by the Health Professions Council of South Africa (HPCSA). After a lengthy legal battle lasting just under two years, last month Noakes was found not guilty of unprofessional conduct. The HPCSA is currently appealing the verdict. Verwoerd is a hugely divisive figure in South Africa. In the mid-thirties, Verwoerd (himself an immigrant to South Africa) protested the arrival of Jewish refugees fleeing from Nazi Germany. I’ve also asked ADSA’s current president Maryke Gallagher for her take. Wow, that is a very tone deaf association for a PR firm to make, but I notice that Naidoo claims association with the Nelson Mandela Foundation. I guess he is trying to “own the insult”. He somewhat misquotes/misinterprets Verwoerd though. Verwoerd was referencing Joshua 9:23 “Now therefore you are cursed, and some of you shall never be anything but servants, cutters of wood and drawers of water for the house of my God.” This was in the context of a speech to parliament defending increased spending on education for the black population, implying that it would have been immoral to deny them the opportunity to become “hewers of ideas”. 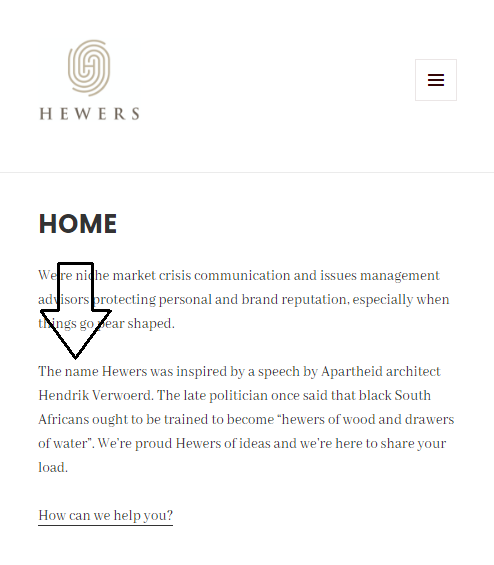 Thanks for commenting, it’s good to have some historical context, and it’s possible Naidoo was in fact trying to “own the insult.” Either way, you’d think a PR company would know better than to link itself so ambiguously with someone like Verwoerd.